600mm diam, max flow 3500gph. Perfect when coupled with our drum filter for a fuss free Koi pond. See filtration packages section of website for ideal packages. The injection moulded filter vessel is pressure rated to 3.5bar. With a 10 year UV and corosion warranty on the tank, and a 1 year warranty on the blower you will have complete peace of mind this item was built to last. 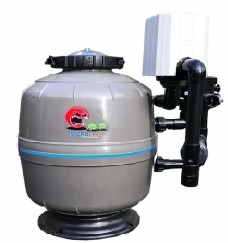 The included air blower means cleaning this filter is quick and easy. Multi port valve for ease of use. 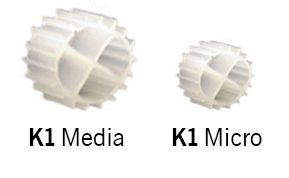 Includes 100L K1 micro media.